Deck shade can come in many different types and styles. Umbrellas are one way to have a little deck shade, or you could get a little more elaborate and install an Alumawood shade. Alumawood is an aluminum product that is so versatile it is perfect for shading areas like decks. Alumawood is also great for gazebos, over hot tubs and small pools. 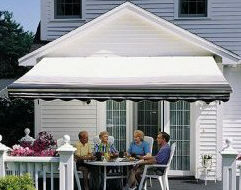 Retractable awnings are another popular way to obtain some partial shade over the deck. If the deck is next to a mobile home or park model an aluminum awning or a solid panel Alumawood patio cover would work well. There are a lot of portable shade ideas that would work well for some quick patio shade. One of my favorites is a shade sail. Depending on your exact application many of the shade ideas we have throughout this site would adapt well. Spend some time and have a look around. Below are some ideas that would be specific to the term deck shade, but don't limit your search to just this page, explore a little and find the shade that is just right for you. Sometimes your shade needs can be as simple as the Eclipse above or the Patio Umbrella to the right. Please visit the rest of the pages in this section for a lot more ideas to shade your deck. SunSetter has made products to shade patios and decks for many years and have become a leader in the shade industry. Patio Umbrellas - Look here for the best umbrellas on the web. 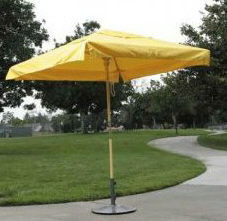 Umbrella Accessories - Check here for lights, fans, stands and screen for your patio umbrella. Beach Shade - Beach umbrellas, golf umbrellas and more. Privacy Screen - Different screens for adding shade to your deck or patio. Grill Cover - A few ways to protect a big investment. Patio Furniture Covers - More protection for your investments. Shade for Children - A few ideas for your young ones.